During either player's turn, you can activate "Magical Musket" Spell/Trap Cards from your hand. 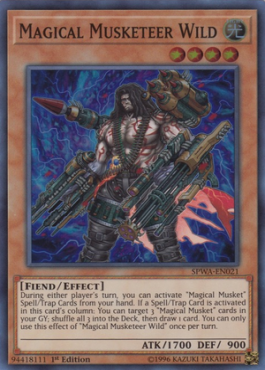 If a Spell/Trap Card is activated in this card's column: You can target 3 "Magical Musket" cards in your GY; shuffle all 3 into the Deck, then draw 1 card. You can only use this effect of "Magical Musketeer Wild" once per turn.